This fascinating space wallpaper shows the magnetic field of our Milky Way Galaxy as seen by ESA’s Planck satellite. This image was compiled from the first all-sky observations of polarized light emitted by interstellar dust in the Milky Way. This fascinating space wallpaper shows the magnetic field of our Milky Way Galaxy as seen by ESA’s Planck satellite. This image was compiled from the first all-sky observations of polarized light emitted by interstellar dust in the Milky Way. 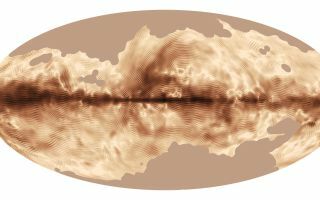 The magnetic field is displayed using a visualization technique called line integral convolution (LIC).